A woman has vanished at a lake in South Florida, and the chief suspect in her disappearance is a large alligator. The alleged gator ambush happened just before 10 a.m. Friday. A witness told police 47-year-old Shizuka Matsuki was walking her dogs near this lake in Davie, Florida. It took authorities more than five hours to trap the 12-foot-alligator. Officials reportedly found an arm inside the reptile. Divers are still searching for the missing woman. "Her husband just called me a half-hour ago, 'Hey something happened with my wife and by your house in the park, and a couple find the dog, but they don't find her," a friend of the victim said. Alligators are synonymous with Florida with more than one million in the state. They can literally show up anywhere. One even watched a 6-year-old boy play on a Slip 'N Slide. His mother Nicole Mojica said she no longer feels comfortable letting her kids play in the backyard. "I told my kids, 'Run! Gator! Run! Gator!' They didn't know what I was talking about," Mojica told CBS affiliate WKMG-TV. The last deadly attack was two years ago when 2-year-old Lane Graves was killed visiting Disney World. But those types of attacks are rare. In Florida, over the last 60 years, there have been 24 alligator attacks where people died. The two dogs are okay. The woman's husband was out of town when the incident took place. Edwin Gomez, a resident who lives in the area, said he was horrified to hear an alligator may be behind the woman's disappearance. 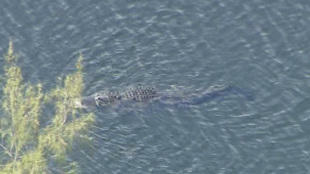 "The gator lurking in one of the lakes is well known to regulars. When I sit in the pavilion, I tell people there's a gator they say, 'OK, this is Florida,'" Gomez told CBS Miami. "Everybody walks their dogs, we go there all the time." CBS News' David Begnaud contributed to this report.